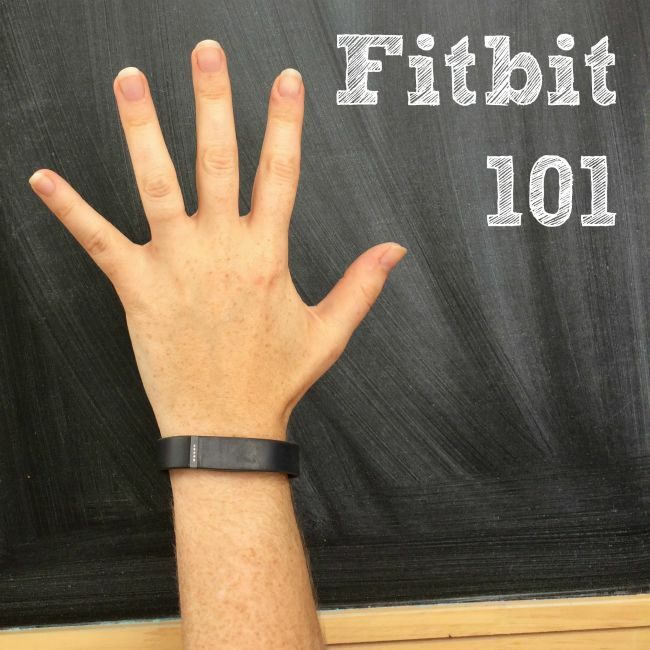 Fitbit 101: What is a Fitbit, What Does it Do and How Do I Get Started? Do you keep hearing about these gadgets called Fitbits? Want to know what the ruckus is all about? Or maybe you JUST bought one and you want to know how to get started. Well here you go! 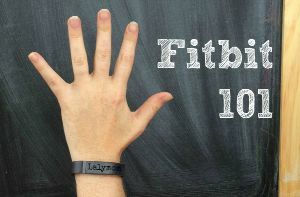 Take a spin through Fitbit 101 to get answers to questions like “What is a Fitbit?” and “What does a Fitbit do?” I've even got some easy shopper affiliate links for you. They're on the news. They're all over social media. Your fave celebrity has one. It's a Fitbit! But what on earth IS that thing anyway? 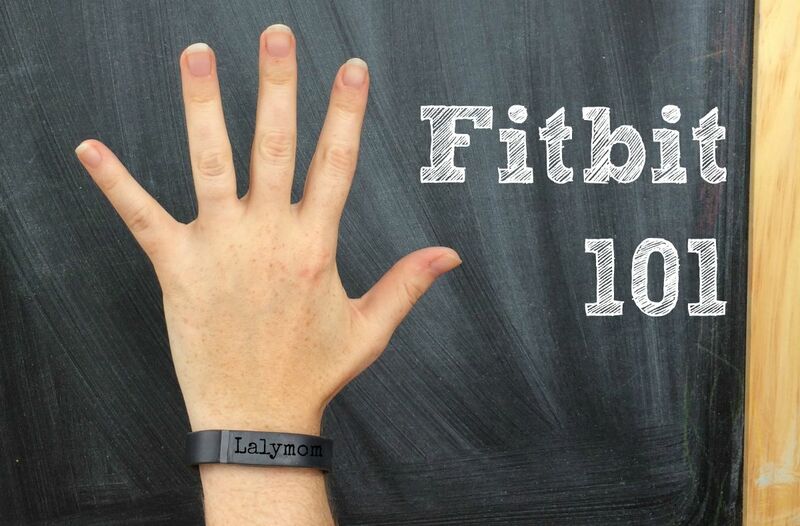 Let's start our Fitbit 101 with that question first. 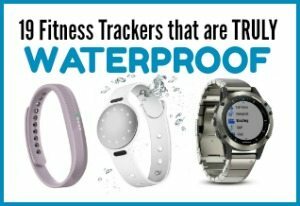 The short answer to that question is that when someone refers to their Fitbit, they are talking about their activity tracker, which ever model they have. Here is the slightly longer answer, though. It's basically 100 steps up from an old school pedometer. It needs a computer in order to charge and in order for you to see all the data and features. It pairs great with a smart phone too since they have an app. Do you NEED a smart phone? No, you can just use your computer but I really feel like the app is a huge added benefit. I compare the Fitbit to a pedometer but to be honest, it has SO many more great features above and beyond a basic pedometer, in addition to being generally more accurate. What Information Can I Track with a Fitbit? So. The main feature of all the Fitbit models (and other activity trackers, like Jawbone and Garmin Vivofit brands) is to track how many steps you take each day. The reason this would be helpful information is that your daily activity level can tell you if you are leading a sedentary life, a moderately active life or an active life. A sedentary lifestyle is becoming very common and can contribute to many health problems over time. 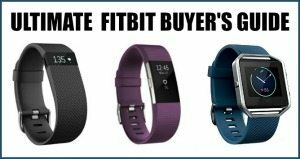 BUY NOW: Check the Ultimate Fitbit Buyer's Guide for historical best prices and where to find the best deals. Okay so….did you get one?! Do you have one?! Are you ready?! Let's GO! When you get your Fitbit your first step is to make sure that puppy is charged! Get the cord, plug it into your computer and charge your Fitbit. Some models have a small tracker unit that pulls out of the housing and plug into the charging cord, while others click right onto the charging cord without removing anything. Next fit your band. 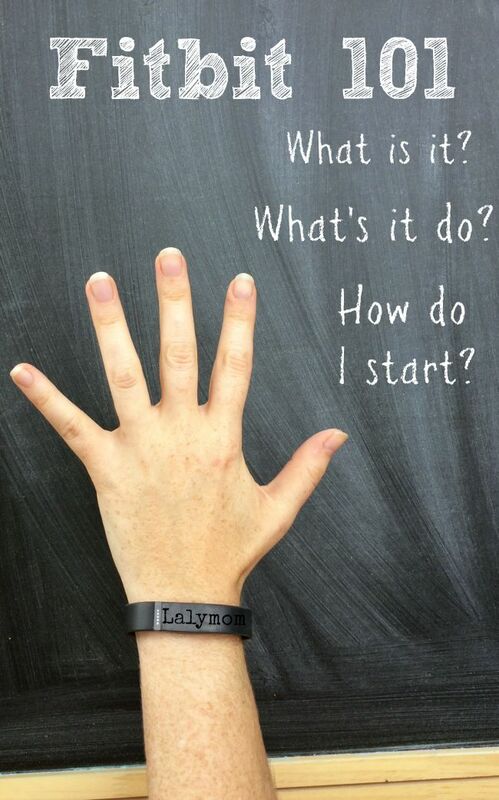 For wrist models make sure you put it on your non-dominant hand. The Fitbit Flex comes with 2 bands, a small and a large so see which one fits you better. Other models have a metal watch style clasp so you can adjust it that way. For clip on models, choose where you are going to wear it and clip it on. Make sure it feels secure and that your arm or other body part doesn't bump it off when you walk or run. Okay. You're ready to get online! You can either head to the Fitbit's Login Page to create an account there or visit Fitbit's Setup Page to get the App. After you sign up it will ask you to sync your device, which is a little for each model. If you run into any trouble at all, the Fitbit Help site is suuuuper helpful. It also houses the user manuals for each model as well as a quick list of links to get your going. Now you're ready to track your daily activity. So…like….stand up and walk around! If you are reviewing your activity on your computer, you can find your step count by clicking Log and then Activities. You can change the time frame from today, a week, a month or a year or use the calendar function to set whatever time frame you want. You can see above that I'm not perfect but I'm improving! That is the whole point. As you are poking around your Fitbit dashboard Log section, you might notices you can track a TON of stuff. You can enter your weight, your goal weight, what food you ate today, how much water you drank, non-walking activities and sleep. Take your pick as to which goals matter to you. You don't have to jump in and do everything on the first day….but I suppose you could! If you are using the app, you will see icons at the bottom of your screen and those are the buttons you click to maneuver between the different sections of the app. The sections are Dashboard, Challenges, Friends and Account. Any red circles at the bottom indicate you have a notification in that section. In the screen shot above I have a notification that my cousin invited me to a weekly challenge! Woo! 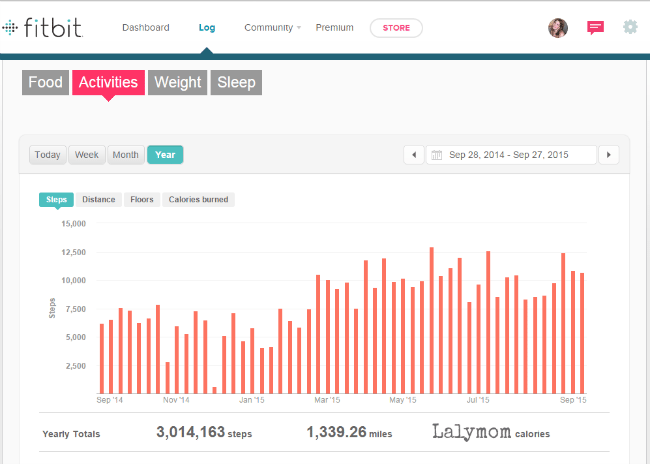 Dashboard is the main screen (shown above) where your step count and other daily goals are displayed. You can log how much water you're drinking, what you had to eat, update your weight and more. If you, say, forget to switch your Fitbit Flex to sleep mode one night, you can go to this screen, click on sleep and towards the bottom where it shows your sleep for this week, click on Today, then there are three dots at the top. Tap those and it will allow you to adjust your sleep. Challenges is where you challenge your Fitbit-wearing friends and family to friendly competitions. You can choose from competitive challenges like the Daily Showdown, Weekend Warrior and Workweek Hustle or the more supportive Goal Day Challenge where you are really encouraging everyone to meet their goal rather than beat them! Friends is where you go to link up to your family and friends who also have Fitbits. You can enter their email address or the app can link to your email account and tell you which friends have fitbits. Finally the Account section is where you go to sync up your device, set your goals and adjust advanced settings. Want more guidance on how to use your Fitbit for weight loss? 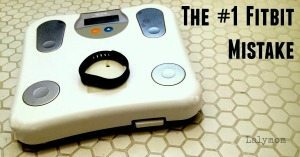 Start off on the right foot with the Step By Step Guide to Fitbit Weight Loss. Now that you know all the areas covered by Fitbit and the app, get walking! You can look back over the days, weeks and months to see your habits as you go. -What is your daily average for a weekday versus a weekend? Or a work day versus a non-work day? -Is there a trip you make regularly that you could walk but you usually drive or take public transportation? -If you take public transportation could you get off one stop early to sneak in some extra steps? -What are your most frequent destinations? How could you add more steps to those trips? If you are looking for more guidance on how to use the information from your Fitbit to help you lose weight, check out my book, Step By Step Fitness Tracker Success. Aim small at first. Increase your step count by 100 steps a day. When that feels good try to think of where you can carve out more steps throughout your day. If you usually use the closest bathroom in your office or home, maybe make it a habit to walk to the farther one? It may not sound like a lot but over time it would add up! Find a friend or relative to challenge if you think it would help motivate you! I am not a particularly competitive person but when you are participating in challenges the app will let you know throughout the day how it is going, so you get little reminders to take a walk. I found that I really started using it more when my cousin invited me to my first challenge. Okay you are up and running, you are tracking those steps and ready to get more out of your Fitbit! Awesome! Check out these additional topics to take it to the next level! 15+ Tips to Hit Your Fitbit Step Goal- From Real Fitbit Fanatics! 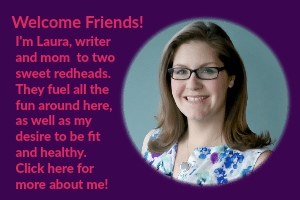 Did I answer your Fitbit questions? What else should I add? Let me know in the comments! I charge my Flex without a computer! When I traveled last summer, I plugged the Fitbit Charge USB cord into the square converter that comes with the iPhone and iPad. I plug that into a socket to charge my Fitbit overnight. I noticed that my FitBit doesn’t charge when I computer sleeps so I am finding this a better method. I assume it also works for the Charge. What a great tip! Thank you! 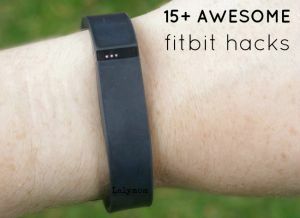 I will add that to my Fitbit Hacks post! Start Menu- Control Panel-Power Options-Choose What Closing the Lid Does. Here you can tell your computer to Sleep, Shut Down or Do Nothing. Select Do Nothing for When I Close the Lid. This will allow your machine to stay on and properly charge. I came to this site late! I hope this helps anyone. Thanks for all your info on fitbit. It is, of course, very helpful. I’m using the fitbit surge with android phone, tablets, and a windows 10 laptop. When I go to my dashboard, then to details about say, heart rate, the display gives a graph with heart rate values on the left. OK, I can use that, but I would like to see the exact times at which I had those heart rates. Likewise, times for sleeping and waking, etc. Is there a way to show the times on the graphs? That would be hugely helpful. Any thoughts? Thanks Rich. I work at a desk job, does the fit bit remind you to get up and move? if not, is there something out there that does? Very informative article. If a Fitbit is a device designed to display data visually, why are there Fitbit head phones? What is their purpose? Hi Charlene, The fitbit headphones pair with the Fitbit Ionic fitness tracker, which allows you to store music on the tracker itself. The Ionic pairs with wireless headphones. The ones from fitbit have some added features that keep sweat out and make it more appropriate for exercise than other wireless headphones. Hope this helps! Have a great day!